Dmitry Trubin loses another one duel. I quietly expected that there will be war, but so that without injuries. However, miracles did not happen. Vitaly met with Dmitry before. But Laletin then weighed 105-108 kg, now he is 120 kg, this is a completely different athlete, he grew up. Although his right hand is injured, he has great potential. I think that he is one of the favorites of the Russian armwrestling, which will reach the level of Denis Tsyplenkov. Denis told it to me, and I did not regret it. But did I regret the participation of Trubin? Nowhere near. Let’s recall that in 2015 he became the intercontinental champion, won against Michael Todd. He pulled well with Andrey Pushkar. What prevented Dmitry from fighting at a high level? As for me, he looked like Rustam Babayev. This is the limit of possibilities. Can Dmitry still progress? It is hard to say. It seems to me that there will be no difference if he gains mass or loses. At the shooting, we saw how and with what weights he performed the exercises, but we understand that iron is one thing, and at the table we see a completely different result. I think that one of the reasons for Dmitry’s not very successful speeches is obsession. Muscle strength has its limit in certain conditions. The usual pyramidal training system leads to this. If Dima does not change his training cardinally, he will most likely remain at the same level and fly out of the tournament. The same applies to Rustam Babayev. 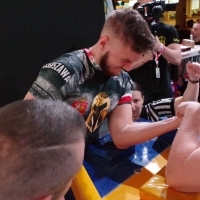 The guys are aging, armwrestling is growing. In the case of Trubin, a large number of experts spoke about this: if you do not want to change anything and train differently, you will not achieve anything.